In the event of a large-scale disaster, the BioSeal Mass Fatality Response System enables you to quickly deploy the tools needed to ensure absolute containment of whole or partial human or animal remains. 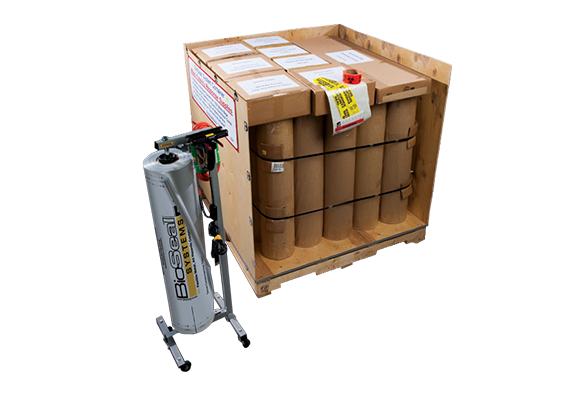 All the tools and equipment needed to ensure Biosafety Level 4 (BSL-4) containment of whole or partial human remains are palletized, wrapped and banded to arrive at your facility ready for storage until needed. It can be stored for 49 years without deterioration in performance or readiness of the BioSeal System material, regardless of conditions. Please call for more info and pricing. "Upon a recommendation of a fellow county coroner we recently ordered the Bio-Seal System. We have used it on two occasions; and I am simply amazed at both how well the system works and its ease of use. We have been able to secure two badly decomposed cases that were contained in the body bag used at the scene into Bio-Seal. The elimination of odor was immediate. This product should be considered a necessity for any Coroner office."